1. Once you finish, you feel a twisted combination of runner’s high and never wanting to run again. Like ever. 2. You are so overjoyed to get a medal that you give a big, sweaty bear hug to the volunteer who gave it to you. 3. Suddenly, stepping onto a curb is like climbing Mount Everest. 4. But finding a shower was oh so worth it. In fact, this is the greatest shower you’ve ever taken. 5. You could eat everything that’s not bolted down. 6. That evening, you contemplate the social implications of wearing your medal to work the next day. 7. 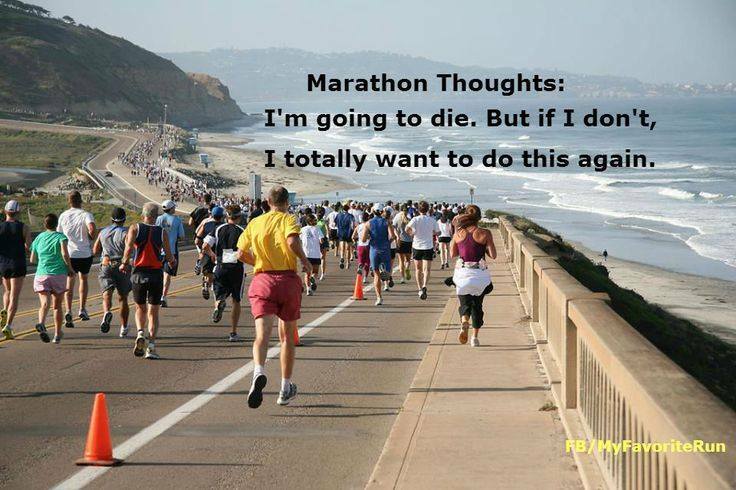 Despite the sense of accomplishment, you decide a hiatus from marathons is in order. 8. Your head hits the pillow, and you’re instantly out. 9. Pulling yourself out of bed the next morning is virtually impossible. 10. At the office–even if you do leave your medal at home–you get all manner of strange looks. Your new mantra: Hobble with pride. This entry was posted in Favorite Run Facebook Posts, Featured. Bookmark the permalink.